I just got my latest electric bill in the mail today. One of my favorite features of the bill is that it shows my electric use this year versus the same month last year. Since I’ve had my electric Mitsubishi iMiEV for LESS than a year, and we haven’t changed our electric use otherwise, it’s a pretty good indicator of our use of electricity for the car. I also track mileage when I use the car for business, and I happened to have entries for the first and last days of the month – 36,119 miles and 37,023 miles. So, I put on 904 miles in the month. That’s within 5% of my estimate of 948 miles, so not bad for a rough guess! Now, let’s imagine that instead of an electric car, I was driving a NEW gasoline car at the national average of 25 MPG. To go the same 904 miles, I would use 36.16 gallons of gas. Which really isn’t bad considering how INEXPENSIVE gas is right now. At my local gas station yesterday, regular unleaded was $2.099. So, that 36.16 gallons would have cost me $75.90. But instead of $75.90 at the gas station, I spent $30.81 on my electric bill. That means I saved $45.09 this past month by by electricity instead of gasoline. Ignoring the fact that all my electricity comes from renewable sources (and that’s nearly impossible to do with a gas vehicle,) my purely ECONOMIC gain comes to $45.09. If that was my average every month all year, I’d save $541.08 annually. Since I paid $7,000 for the car, it would take 12.94 years for the car to pay for itself! That sounds like a long time, BUT, here’s the thing: Most cars NEVER pay for themselves! We buy cars not as a way to save money, but as transportation. The next time somebody asks me what my “Return on Investment” is on the car, I’ll ask them what the ROI on their Mustang/Corvette/Suburban/BMW is. Figuring in the savings on maintenance, driving more miles per year, or gas prices going up all make the car pay for itself SIGNIFICANTLY FASTER. In the real world, I’m guessing this car will actually pay for itself in about 5 years. Since it was already a 3 year old car when I got it, that means I’ll have an 8 year old car, that has completely paid for itself. The average car in the U.S. is now 11 years old. I’ll have a newer than average car, completely paid off (I didn’t take out a loan on it in the first place! ), and having paid for itself, while still under it’s 100,000 mile warranty. Of course, I won’t know the real “pay-off” date until that time in the future, as that will all be based on actual miles driven and actual gasoline prices. But let’s do an imaginary scenario. Let’s say that you drove the average number of miles per year in the U.S., and you are driving an electric car in my area. How much would you really save if gas prices went up? Let’s say to 2008 prices. The average miles driven in my age and gender bracket is 18,858 miles. (Wow! That’s a lot…) That, times 25 MPG is 754.32 gallons times $4.00/gallon is $3,017.28. At that fuel cost, my electric car would totally pay for itself in two and a half years! Moral of the story? The more you drive and the more expensive gasoline is, the more cost savings an electric car provides. But even if you don’t drive all that much, and gas is cheap, you can still enjoy the instant torque, quiet ride, and renewable-sourced energy of your electric car! PS: Just wait until I have my solar photo-voltaic system installed. The financial Return on Investment of solar combined with an electric car with BLOW YOUR MIND! PPS: Another way to look at all this. How would you like to have an EXTRA $50-$100 going into your retirement or college-savings fund every month? I love electric cars. But I think there are differences in the ‘pay back’ depending on where you live. I live in New Jersey. I leased a 2013 Ford C-Max Energi. Granted, it’s a plug in hybrid that gets about 20 miles on the battery and then switched to a standard hybrid model. But it allows us to compare battery versus hybrid operation. I had the car for 2 years and ended up about 96% of the time running on full electric battery. In the spring and fall I could get about 30 miles on the battery. I track my utility usage monthly and in comparing the last 8 months without the car charging every night against the same 8 months last year and the year before with my C-Max the differences were within the usual fluctuations of my electric usage. Just too small to really account for. So to compute the electric usage we may use the same average you site of 4 miles per kWh. Converting that to actual costs depends on the kWh rate which in my location is 0.175 per kWh. That means the listed Energi 7.6 kWh battery charge costs me about (7.6 * 0.175) $1.33 to ‘fill up’ If I get an average of 25 miles per charge that’s (1.33 / 25) 5.3 cents per mile. But gas here is about $2.00 per gallon (actually about 1.80 today but we are about to add .20 taxes) and to be fair, we need to use the 40 mpg I would get in hybrid mode to compare so that would cost about (2.00/40) 5.0 cents per mile. So if my math is correct and my premise sound then I am loosing money driving the Energi version vs the standard hybrid. So it really depends on how much of a difference the cost of electricity is compared to gas in your area. But I like this car so much I’m now shopping for a used C-Max Energi. As you say, the other benefits make a compelling argument even if I personally can’t have my plug in hybrid pay for itself. At least not at today’s gas prices. Thank you for this well thought out article. With this little blog entry, I really just wanted to touch on the basics. There certainly are a lot of other things that go into total cost of ownership, and with the extremely LOW gas prices right now, EV sales have really been hurt in that they simply do NOT save the money that they do when gas prices are high! The best I can recommend to anyone is for them to examine their own situation and decide what’s right for them! I think that in many cases, Plug-In Hybrids are great cars for a lot of people. In my personal case, I’ve really liked my electric car overall. Even though the economic ROI isn’t as quick as I’d like it to be at the moment, I still wouldn’t trade it for anything! 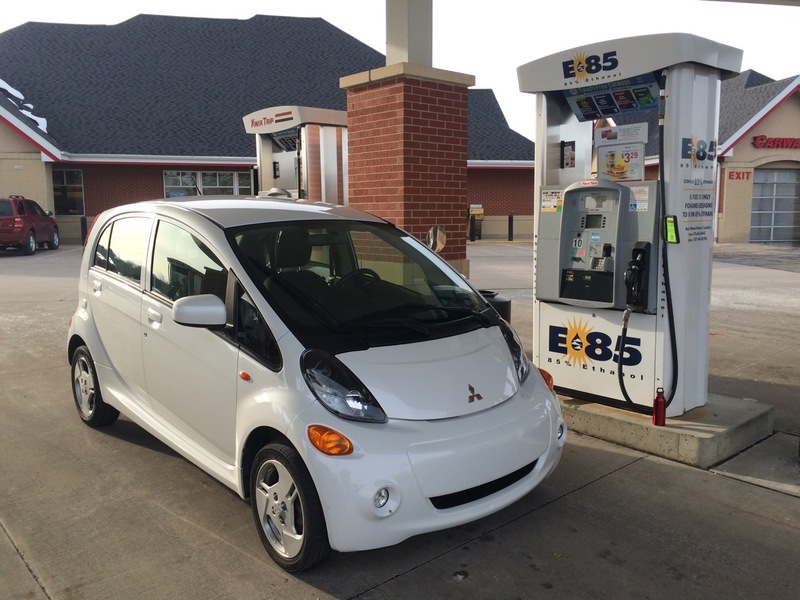 I own a 2012 Mitsubishi iMiev also; purchased in Sept 2015. However, I have a 9.4kw solar panel system installed on my home. Since I get home around 5PM here in San Antonio, Tx, this means that my car charges up using only solar (round trip commute to work and home is 26 miles). Also since I bought my Miev, my wife doesn’t drive her Honda Accord as much which results in lower monthly gas purchases for her also. Altogether we save (by not buying gas) about $100 per month. I’m working on my own solar system. Cant’ wait to get it up and running! Thanks Ben, that’s a great little summary. I recently did a similar analysis. Our gradual addition of conservation measures at home and adding a small 2.2 kW solar array made adding 19,000 miles of electric driving per year during the same time unnoticeable! Next post: On a Bike!